We link all your financial accounts for a complete and up-to-date view of your financial situation. Our analysis and recommendations are comprehensive and reflect current market conditions. Our 360˚ view of your financial world can help improve overall performance, minimize the impact of debt and taxes and enhance your lifestyle. With your goals as the centerpiece of our process, we provide you financial reports that clearly illustrate where you are now and how our recommendations can help you reach your goals. With a daily snapshot of your progress, we can alert and remind you of financial factors that may impact your ability to achieve your goals. This relieves you of organizational burden, allowing you to focus your energies on what matters most in your life. 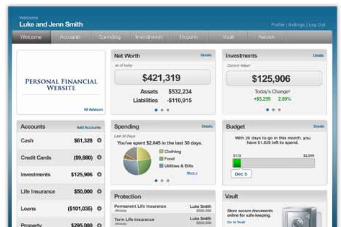 Our wealth management system provides both you and our team with a secure view of your financial progress. We can collaborate with you online at anytime, no matter where you are.